EXCLUSIVE: Aspen Words Literary Prize Unveils Its Finalists Five books remain in the running: Tommy Orange's There There; Tayari Jones' An American Marriage; David Chariandy's Brother; Jennifer Clement's Gun Love; and Friday Black by Nana Kwame Adjei-Brenyah. 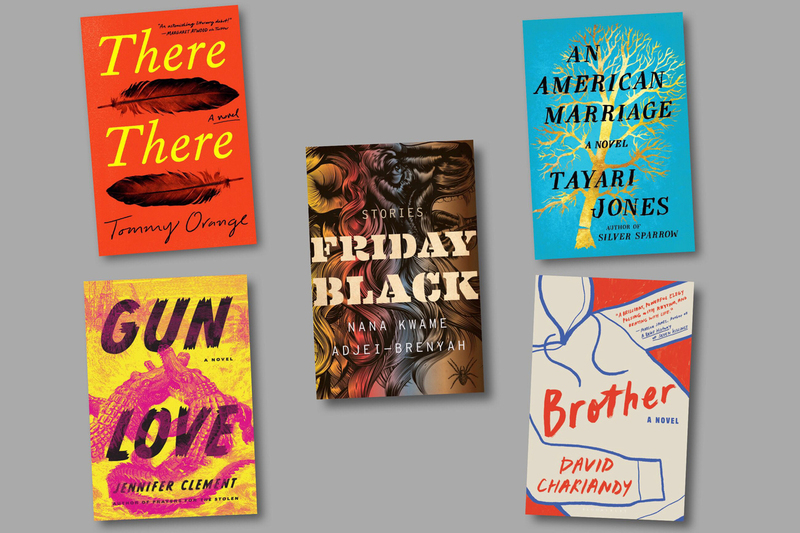 The 2019 Aspen Words Literary Prize shortlist (clockwise from top left): There There, by Tommy Orange; Friday Black, by Nana Kwame Adjei-Brenyah; An American Marriage, by Tayari Jones; Brother, by David Chariandy; and Gun Love, by Jennifer Clement. Still in the running for the $35,000 prize are: There There, by Tommy Orange; Friday Black, by Nana Kwame Adjei-Brenyah; An American Marriage, by Tayari Jones; Brother, by David Chariandy; and Gun Love, by Jennifer Clement. "If a reader were to read all five books, they would see a range of issues that have risen to the forefront of our social and political discourse," says head judge Samrat Upadhyay, who was a finalist himself in the prize's inaugural year last year. That means a smorgasbord of social problems — from racial inequality to gun violence and insatiable consumerism. But don't expect the dryness of a textbook here. "These books are not pedantic. So there is also a lot of pleasure, there's a lot of humor, there's a lot of compassion, and most importantly, they have incredibly compelling characters," Upadhyay tells NPR. "These are not authors who are sitting on a pedestal somewhere and lecturing to us," he adds. "These are authors who are creating these very multidimensional characters, through whom we are exploring these topics." The Aspen Institute has partnered with NPR to announce the winner at an April 11 ceremony in New York City, where NPR's Renee Montagne will moderate a conversation with the finalists. In the meantime, find all five below, together with the judges' description of each work and any prior coverage by NPR where available. "Pulsing with a beauty that is bold and unrelenting, Friday Black is an uncompromising look at the ailments of our time. Nana Kwame Adjei-Brenyah delivers punches in story after story that awaken us to our absurd realities: brutal racism, murderous consumerism, copycat school shootings. Friday Black is filled with humor and a fierce intelligence. It also proves, once and for all, that the form of the short story is perfectly capable of taking on our political urgencies." "Brother, by David Chariandy, is as heart-wrenching as it is beautiful. This is a story of love and compassion between and for characters relegated to the margins because of their class, their color, their immigrant status. These characters are full of longing and disappointment: parents who want more for their children, and children who seek to create themselves, art and a better world. They do so in a context that constantly tries, and all too often succeeds in destroying them. And yet, driven by love, they insist on their humanity." "In Gun Love, Jennifer Clement gives us fourteen-year-old Pearl who has grown up on the front seat of a '94 Mercury next to a trailer park in central Florida — a place she knows is nowhere. Here is delicious lyrical language, sudden violence, and compelling characters who might save you and then again might not. And yes, guns — guns in the hands of people for whom 'life is always like shoes on the wrong feet.' This is a scary, heartrending story, stinking of cordite and mildew — like a tantalizing phone call from the underclass." "Tayari Jones's An American Marriage is a gripping novel about the dissolution of a marriage. But beneath the surface of this deeply moving love story is a powerful statement about unjust incarceration and a corrupt criminal justice system that has ravaged generations of African American families. Writing with poignancy and humor, Jones offers a much-needed meditation on issues of race, class, identity — and shows us how to move forward after a great loss." "In this heartrending debut by Tommy Orange, a member of the Cherokee and Arapaho tribes, we journey with an extraordinary cast of 'urban Indians' to a huge powwow in Oakland, California. From a daring opening essay to a harrowing finale, the novel is an explosion of poetry and violence, hope and despair. Questions of identity and authenticity, loss and discovery, tradition and escape are woven brilliantly together in this tour de force about the continuing shame of America's treatment of its Native people."